Writing a business letter can be a bit tricky the first few times. 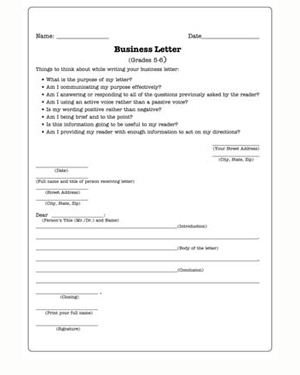 Use this letter writing worksheet to help 5th graders write business letters with ease. Students should read through the questions in the beginning of the worksheet, write the business letter in the space provided below it, and then go back and read the questions again, making sure they are answered satisfactorily. Using this writing practice worksheet helps students write their business letters concisely and to the point, without spending too much time worrying about format.